Alan Pardew is considering a recall for Massadio Haidara as he gets ready to shake up his Newcastle United team – and assess who will play a part in a re-modelled Magpies side next season. Fresh from a three-match stadium ban, Pardew returns to the fray this afternoon as United take on Southampton and he is prepared to make changes to the team to reverse a run of two defeats in the last three games – and a run of just one goal in that trio of matches. The Journal understands that France under-21 defender Haidara is now in line to make his first Premier League start of the season at Southampton, with Paul Dummett set to drop back to the bench. And that is an interesting development with the Magpies boss considering major changes over the summer. United have a three-way battle for the left-back slot with Davide Santon having endured a difficult campaign. He is contracted until 2016 but is understood to be on weekly wages of more than £30,000 – which makes him potentially vulnerable as United look to invest in their squad in other ways. Santon suffered a bout of tonsillitis and a knee problem and was battling to be fit for today’s game at St Mary’s. If he fails a late fitness test it will be Haidara who gets a chance to audition for a more central role in Newcastle’s back four next season. Dummett still has a big part to play in Pardew’s plans but there is a feeling that he may need a rest after a difficult night on Tuesday. The Wales defender has been backed by Pardew to bounce back after his longest spell in the team since emerging from a positive loan spell at St Mirren. United are no further forward with their plans for the summer but after months of drifting, the re-emergence of Mike Ashley has added some renewed momentum to their attempts to reshape the squad in the close season. Newcastle want at least one more striker addition but there is not understood to be any interest in Metz striker Diafra Sakho, though – who was linked earlier this month. Pardew suggested yesterday that owner Ashley wanted Newcastle to play a more attacking style next term. “He is very much aware. The one thing Mike likes in his teams is them to be on the front foot and trying to win the game,” he said. “I don’t think he likes tactics where teams set out to defend deep and look to nick something, it’s not the way he is. 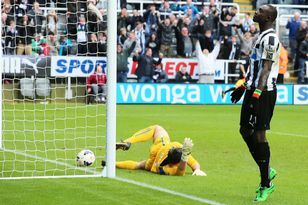 There were a fresh crop of reports suggesting Loic Remy did not want to join Newcastle yesterday, but he is not understood to have given any indication on his future to United chiefs. There is an acknowledgement at St James’ Park, however, that Remy holds all the cards and a permanent deal is very much dependent on what other offers he gets. Arsenal continue to be linked, with Pardew saying Newcastle will replace him if he leaves. Meanwhile, Southampton defender Jose Fonte has praised Pardew, his former manager at Saints – “I owe a massive amount to him” – as well as the man currently at the helm, Mauricio Pochettino. “We players love to play under him, we love his philosophy, style of play and the way he manages is top,” said Fonte.